Welcome to the Photography Blog of the London Photographic Association (LPA) & LPA movingPictures. The LPA works with its international membership to expose and promote new talent through exhibition, publication and online exposure. Burkhard Schittny has worked on personal photography projects throughout his career, even whilst focused on working as commercial photographer for advertising and magazines between 1997 and 2007. In 2007, he decided to concentrate fully on fine art. 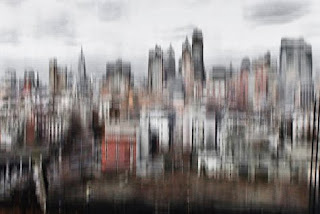 In the winter of 2007, Burkhard travelled to New York City. "When I started filming I didn't have a real concept in mind," he says. "I just wanted to do something. Later, after selecting the stills and working on them on the computer, I realised most of them had a gloomy, murky touch. The series, now called UNTITLED, somehow came back to ideas and feelings I had when I was creating the video performances for my MA at Central St Martins: desperation, insecurity, anonymity and alienation. The stills are like scraps of memory struggling to reveal the fear of a place - fragmented and out of focus." For these projects, Burkhard films on a consumer video camera, selecting the images on a computer. All images are full frame with no composing, just colourshifting and saturation and desaturation in photoshop. "I keep the characteristic interlaced lines that video creates," he says. "Ideally, the work should be viewed in large scale to understand the construction and deconstruction of the subject." Burkhard is currently working a series of around 20 new images from different places. He received a project grant from a German organisation for his landscape series and will use the funds to shoot a project about trauma and his own family history in Poland. He hopes to exhibit his UNTITLED series in the near future. The LPA runs four stand alone websites which are all interconnected. Please contact us through the main LPA website. Sebastian Rich: The Argentine Gaucho.